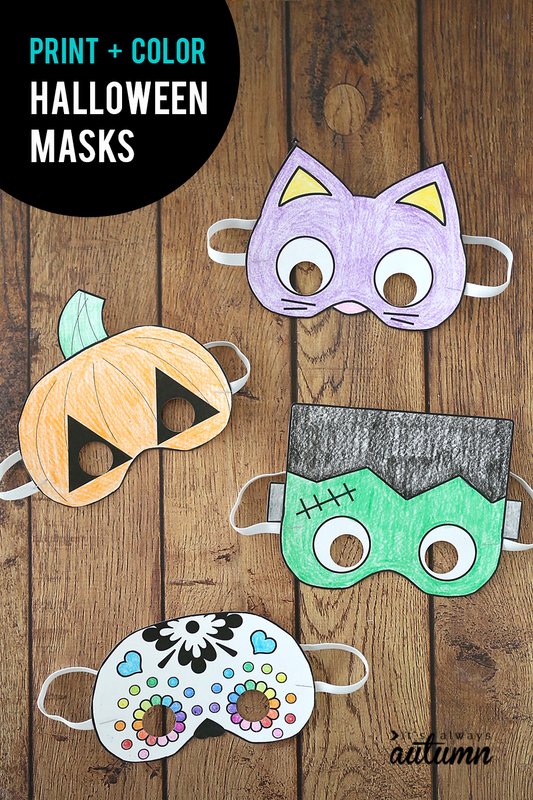 In today’s post: Print + color Halloween masks are an easy and inexpensive Halloween craft for kids – perfect for class parties! 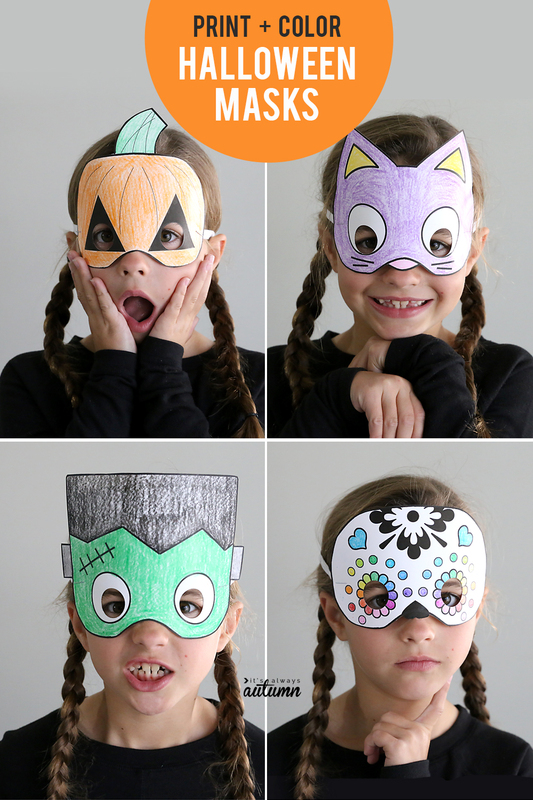 I originally shared these easy DIY Halloween masks a couple of years ago, and many of you let me know that you used them as an easy activity for your kids’ school Halloween parties. Since we are headed back into Halloween season I thought I’d republish so those of you that weren’t reading a few years ago could see them too. 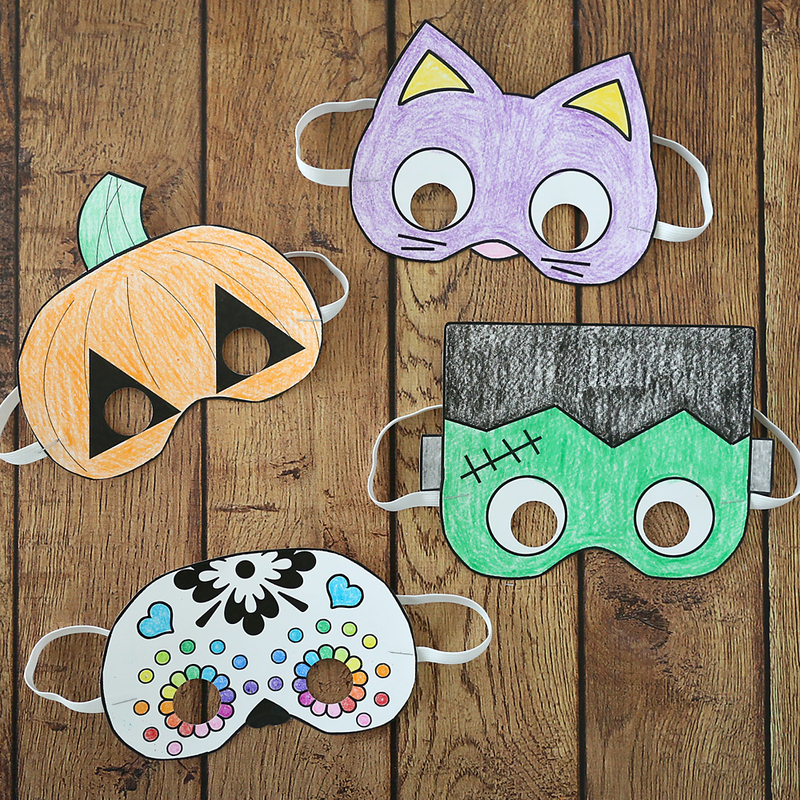 If you’re looking for another easy Halloween craft for kids, check out these printable Halloween origami bookmarks. You can download each of the mask designs for free at the end of the post. Make sure you print them out on cardstock or other heavy weight paper so they won’t tear. It’s also a fun activity to do at home. The masks are easy to make and low on the mess scale. We just used colored pencils, but you could use crayons, markers, or even paint, and then add stickers or glitter if desired. My kids had friends over when I printed out all these samples and everyone had a great time picking their favorite mask and then decorating it to their heart’s content. You can download the different Halloween mask designs here. Be sure to print at 100% or full size. NOTE: All masks except Frankenstein come 2 to a page. 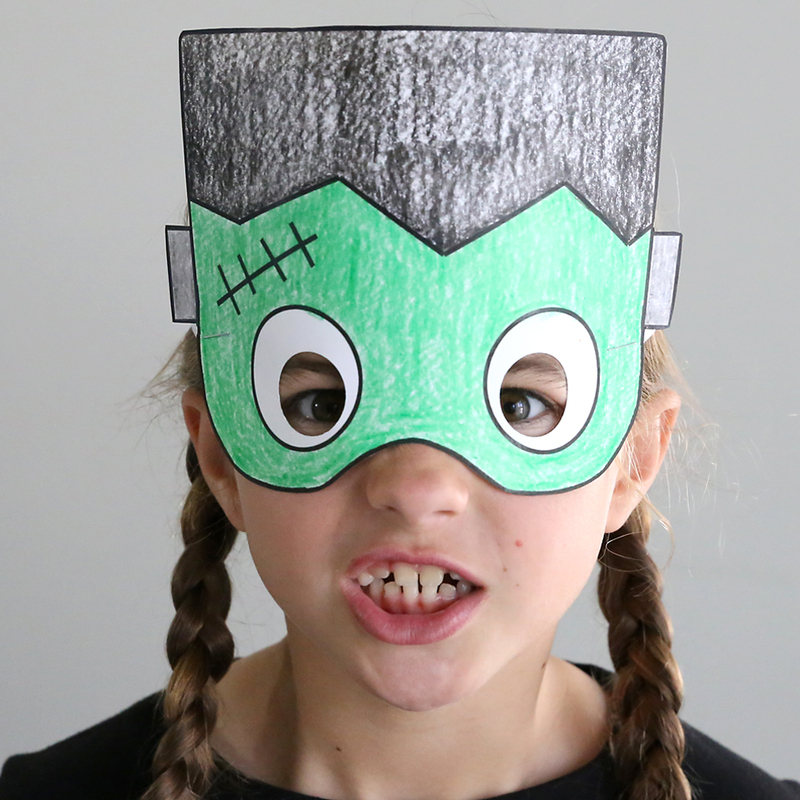 Download the Frankenstein print & color Halloween mask by clicking here. 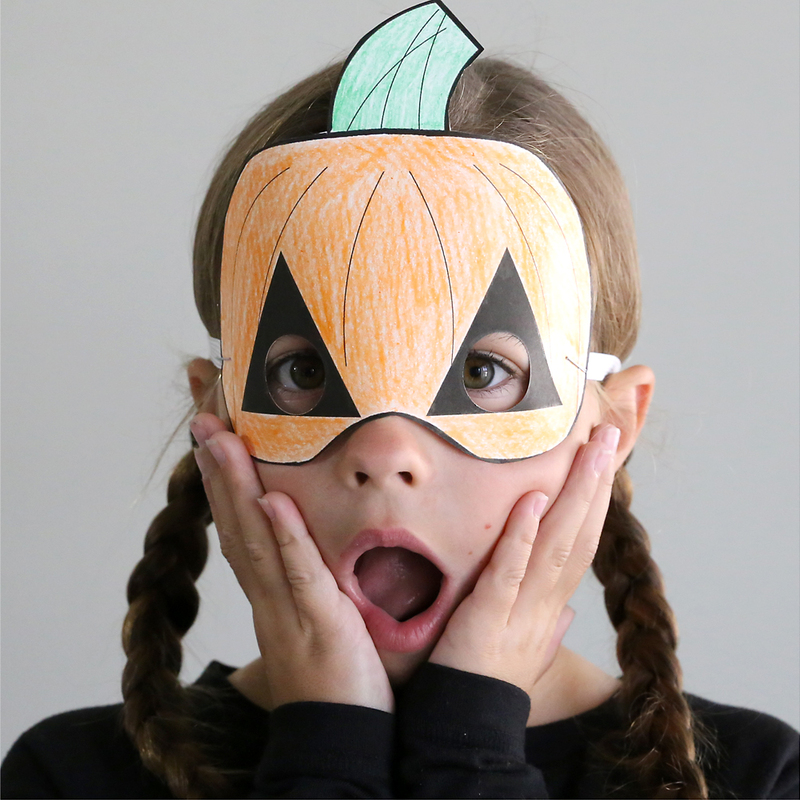 Download the Pumpkin print & color Halloween mask by clicking here. 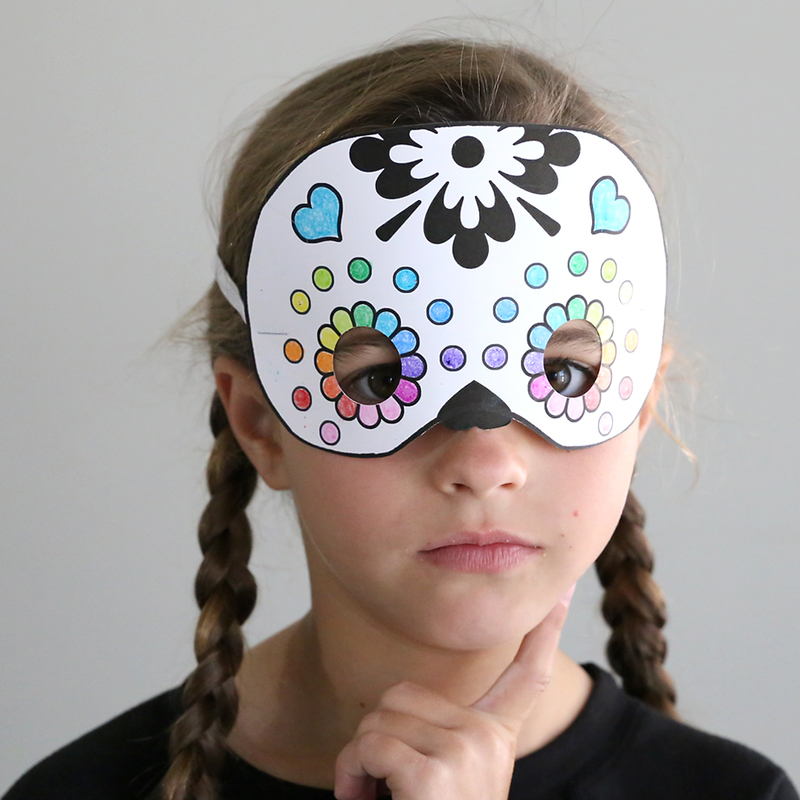 Download the Day of the Dead print & color Halloween mask by clicking here. 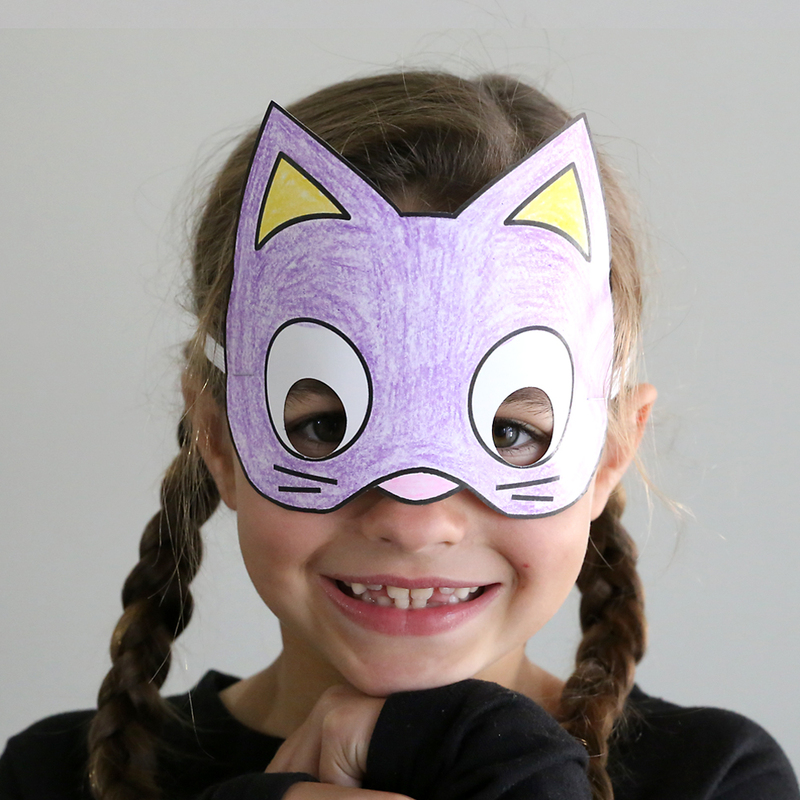 Download the Halloween Cat print & color Halloween mask clicking here. The little kiddos at our county fair, a couple of weeks ago, had a “make-it/take-it” opportunity (it was “Kids’ Day”) and this project was one that many of them accomplished…………….evidenced by the large number of masked cuties seen the rest of the day!!!!!! I love this. Thank you so much for putting this together! Hello can you tell me where you purchased the big hole puncher for the eyes? I had the children choose a mask and color it. I then laminated it and cut the holes out for the eyes with scissors. A large popsicle stick was hot glued to the side so the children could hole the mask up to look through. Each child then graphed the number of different masks that were made. Why is it so hard to down load the masks. I did the download but still there is no masks to print. I could not find a hole punch at Walmart or Target. I did find one at Michaels. Sadly, I bought one that did not reach the eyeballs, do not buy the Fiskar Thick 1 inch. The one that does reach the black eyeball area is the ek tools 1″. I used it on printer paper, so I do not know how it will do with thicker paper. If you can’t find this one, make sure to look at the hole punch from the side to make sure there is enough space to fit about an inch of paper before getting to the black eyeball area of the mask. I would also like to know the brand of hole punch you used. The one I got from Hobby Lobby won’t reach the eyes on the mask either. same here. Ive purchased multiple hold punches from various places and am having the same problem. I am using this for a craft for two different places and am struggling with this very issue! These are so cute!! I’m going to link back to you in a Halloween craft post I’m publishing later this week. I love that these are easy enough for smaller kids to color, but older kids can still make them their own! oh these are so fun! I think I’m going to keep my kids quite happy (AND BUSY) with these! Thank you so much for sharing these! Hello! i totally love your page. I have a teacher page on Facebook. But i credited you ofcourse and your amazing page. Hi Tanja! I’m so glad you liked my masks. I would love it if you shared the link to this post on your teacher page so that your followers can click through and download the masks themselves. But please don’t actually upload the templates to FB – my income is based on page views and so when I offer things for free I need the people who want them to actually click through to my blog to get them (otherwise I lose out). Thanks! The masks are cute, but I cannot support the use of the plastic water bottles as a treat. They are an incredibly wasteful use of plastic, especially at home, where fresh, safe drinking water is readily available. Thanks so much for sharing these masks! The kids will LOVE them! I can’t wait to sew your swing tunic. I love the way it move around the body without giving a definite body shape. Great for those areas I don’t want to accentuate. 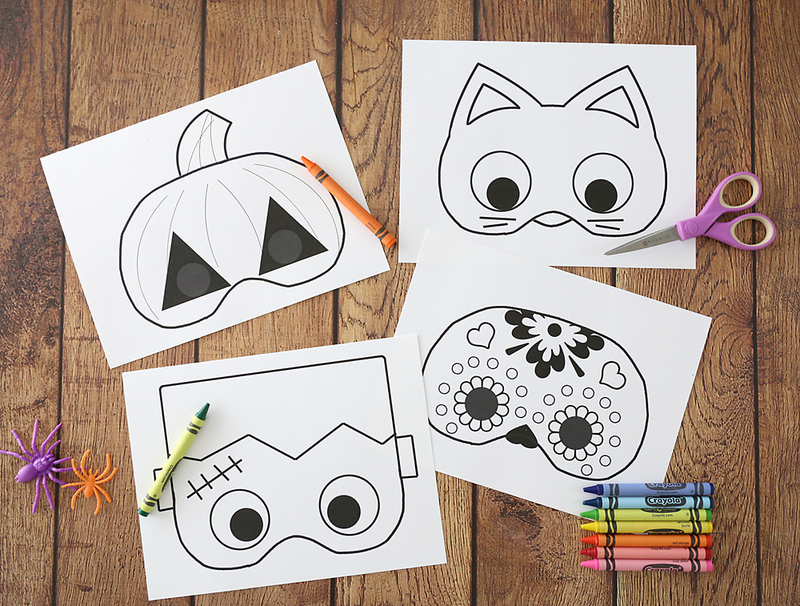 As for the Halloween masks the grand kids will love to colour those. Hi:) thanks so much for posting that free download for the mast. I was wondering about the 1 inch punch that you have. I have one but when I go to punch the eyes Out it doesn’t go all the way up to where the eyes are. Do you have a special one?